As a jet fighter squadron commander LIEUTENANT COLONEL ALBERT J. AMATUZIO had ample opportunity to witness synthetic lubricants in action. During Lieutenant Colonel Al Amatuzio's 25 years as an award-winning jet fighter pilot, he gained a solid appreciation for the extraordinary lubricants that protected the engines of the jets he flew. He knew that only these lubricants, synthetic lubricants, could stand up to the demanding operating conditions of jet engines and the severe temperature extremes they encounter. He knew also that the same outstanding performance benefits synthetic lubricants provide for jet engines would prove invaluable to car, truck and other internal combustion engines. In the mid-1960s, Al Amatuzio began an intense period of research and development. He assembled the industry's most knowledgeable chemists and directed the formulation of the first synthetic motor oil in the world to meet American Petroleum Institute service requirements. 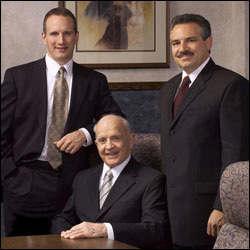 Under the leadership of President Albert J. Amatuzio, along with Alan Amatuzio, Executive Vice President and COO (Left), and Dean Alexander, Executive Vice President and General Manager (Right), AMSOIL remains the leader in synthetic lubrication technology. More than 100 products to choose from, AMSOIL has grown form its 1st. product release in 1972. AMSOIL now also offers a variety of Car care products, Wiper blades etc. The introduction of AMSOIL synthetic motor oil in 1972 set all-new standards for motor oil quality. AMSOIL synthetic motor oil products outperformed conventional petroleum motor oils on all counts. It was clear from the start that this innovative product would play a major role in engine performance and engine life. The AMSOIL corporate headquarters, located in Superior, Wisconsin, further demonstrates Amatuzio's commitment to excellence. The AMSOIL building is a beautiful, historic building located on Superior's Tower Avenue. Originally built in 1892 as part of the city's Berkshire Block, the building is constructed in an elegant Romanesque architectural style with Kasota limestone from Southern Minnesota. The AMSOIL corporate head-quarters feature state-of-the-art facilities, including a new business computer system and modern telecommunications devices. Staying on top of current technology reflects the AMSOIL commitment to producing the world's finest lubrication products, fast and efficient order processing and excellent customer service. Throughout its more than 100-year history, the AMSOIL building has had many occupants, the first being the State Bank of Wisconsin. Physicians, attorneys, and Superior's first television station have also called the building home over the years. It became the AMSOIL building in 1978 and has been completely renovated. The AMSOIL research lab has been redesigned to incorporate more of the latest cutting edge technology and research equipment. The overall size of the facility was doubled, allowing more capacity for testing, formulating and research. The tanks feature large AMSOIL logos that can be seen from nearby overpasses and freeways. AMSOIL storage and holding tank facilities were renovated to include over one million gallons of oil storage capacity. The AMSOIL Superior Distribution Center encompasses over 110,000 square feet. Product is stored here in thousands of bottles, pails, barrels and totes. The buildings also include oil and other fluid production equipment, billing and packaging facilities, vehicle and equipment maintenance garages, and mechanical testing facilities. Technical services is located at one end of the Superior Distribution Center. The newly remodeled facilities also include areas for manufacturing, industrial and technical sales personnel.